After a seemingly endless string of essays, assignments and exams, you’ll be glad to see the end of this semester and will be looking forward to a welcome break over Christmas. Whether it’s attending every lecture, spending more time in the library or not leaving assessments till the night before, many of us have already made our New Year’s resolutions. However, if you’re sick of wearing your old track pants and t-shirts around campus, why not vow to become a student style icon next semester? Here’s the key pieces you’ll need. Trekking from building to building can expose you to the cold weather, so you’ll need a great coat to keep you warm in the process. We have recently seen a revival of padded jackets, with everyone from celebrities to the fashion elite seen donning them. Offering unparalleled warmth as well as on- trend style, it’s easy to see why. When it comes to buying a coat, you should be prepared to pay a little bit extra to ensure that it will last you year after year. Take the Superdry Fuji jacket for example: available from the range of Superdry items at House of Fraser, the coat boasts a classic design that will remain in fashion for years to come. Plus, thanks to the brand’s outstanding reputation, you know it will be good quality too. Making a seasonal transition is never easy; there’s always that in-between period, where it’s not quite hot enough for summer clothes but it’s too warm for your winter items. That’s where the sweatshirt comes in. Wear it with a coat for those colder days, or without for when the temperature starts to rise. 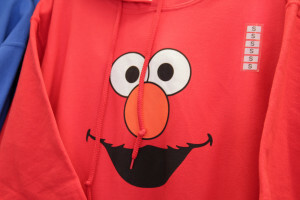 The sweatshirt has played a major role in the 2013 revival of street wear, with printed designs and bold graphics dominating. This trend looks set to continue into 2014, so make sure you select a sweatshirt with a bold, eye-catching design. This New Love Club one from Topman would be ideal, and you can take advantage of your student discount too! Your dark jeans are staples for winter, and your light wash denim is a summer essential – but what do you wear in-between? Mid-wash of course. The medium hue of these jeans will provide the perfect base for your look. For a casual, laidback look, go for a slightly distressed pair to add a rugged edge. These Dean straight jeans from River Island would be a great choice and are perfect for popping to the SU for a pint or two.